Posted on March 27, 2018 Categories ready to wearLeave a comment on What you should wear if you are in the Royal Enclosure at the Royal Ascot meeting and how TravellingTailor.co.uk can help you out. As we gear up for the TravellingTailor.co.uk Spring/Summer 2018 season, it seems everything and nothing has changed from our old Laurie Hopkins Menswear days. What I mean by that is; we used to have an ‘in house joke’ about the start of the Spring/Summer season. We would comment that the first time Jayne dressed our windows (at our shop in Lindley, Huddersfield) with the new season Spring/Summer menswear collections, it would snow! Now fast forward to life as TravellingTailor.co.uk. Yesterday morning I was getting ready to visit a client in Skelmanthorpe to show him my range of ready to wear mens suits. At around 10am, a DPD driver turned up with a parcel. It was the Spring/Summer 2018 Meyer trousers and shorts stockbook. As I signed for the book I noticed it was snowing ! 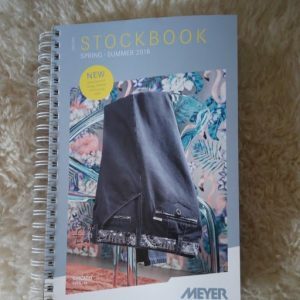 Meyer Spring Summer 2018 stockbook. So it would appear that whilst everything has changed in relation to our shop and what I do now, very little has really changed. I still provide quality menswear at realistic prices. It’s just that it’s now done in the comfort of your own home or office. 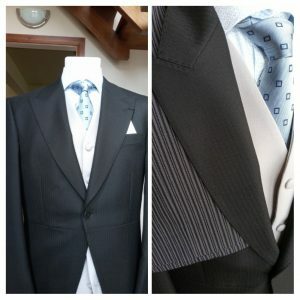 TravellingTailor.co.uk is more than just Made to Measure suits and jackets. 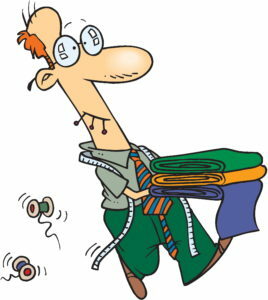 Although made to measure is big part of the business. 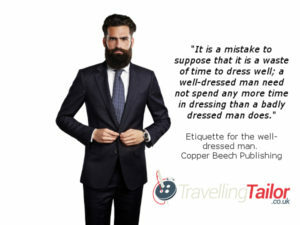 TravellingTailor.co.uk is also about providing Ready to Wear menswear and Corporate Clothing to customers, when they want it and where they want it. In January 2018, TravellingTailor.co.uk visited clients in Yorkshire and beyond. We provided them with Made to Measure suits, ready to wear suits, trousers, denim jeans and chinos. We’ve supplied both ladies and gents corporate wear to clients. We’ve talked to prospective Groom’s about their Wedding Suit requirements and taken orders for made to measure and ready to wear suits for wedding parties as well as Dinner suits for evening functions. Here at travellingtailor.co.uk even had enquiries to supply ready to wear Morning Dress suits complete with Top Hats for Royal Ascot. So, whatever your Menswear requirements, TravellingTailor.co.uk can help, why not give Michael a call on 01484 511088 or 07885 298700 to discuss your Menswear needs. Hi, we are getting married in October this year. We would like the men in our Wedding Party to wear the same colour suits but the ones we like are all ‘slim fit’ suits. This fit is not suitable for the Dad’s and Grandad’s in our party who prefer suits that aren’t quite as fitted. Is there anything you can suggest to help us? PS: We don’t want to have made to measure. First, congratulations you on your up an coming wedding to Paul. Regarding your problem, I understand where you are coming from and it’s a problem I’ve come up against on a number of occasions before. Fortunately, one of my suppliers has come up with a ready to wear solution to your slim fit or regular fit wedding suit issue. They offer 6 different poly/wool cloths which are available in either Contemporary fit or Premier Fit. Contemporary is a slightly tailored fit and Premier is as fully tailored fit. All cloths are available in 3 piece or obviously two piece with the Contemporary fit available in sizes 34” Chest – 54” Chest and the Premier in 34” Chest – 50” Chest. All suits are sold on a mix and match basis. This means that we can get any size jacket to match with any size trousers. You’re not restricted to the 6” drop from chest to waist that standard ready to wear suits tend to have. Each fabric is also available in Short, Regular or Long fit meaning that from ready to wear we can generally fit most members of a wedding party. You can choose from Black, Dark Ink Blue, Charcoal, Blue Sharkskin, Ink Sharkskin or Blue/Black pin dot fabric. They also offer a Silver Grey pick’n’pick that is available in a Classic Fit as well as Contemporary and Premier fit. If you were wanting a more luxurious super 100’s pure new wool suit, we can supply that. 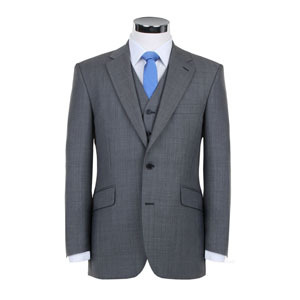 We deal with a German supplier who offer Super100’s suits in classic fit, slim fit and extra slim fit options. I trust that this response helps you in your quest to find suitable wedding suits for your party. I am more than happy to visit you and show you the patterns available in our ready to wear suit selections. Please contact me (Michael) on 01484 511088 to discuss your ready to wear slim fit and regular fit wedding suits. Sat at my laptop late on Friday afternoon last week and the phone rang, it was a long standing customer of ours from Laurie Hopkins Menswear. That’s how I found myself measuring a customer for a ready to wear suit on Sunday afternoon, he chose one, it’s ordered and the required alterations booked in. Today (Tuesday) I have delivered my customer’s new suit, fitted and ready to wear for the wedding on Saturday. Two phone calls and one visit, a new suit sorted and ready for delivery, that’s the idea of TravellingTailor.co.uk, we take the stress out of Menswear. Why not give us a call on 01484 511088 to discuss how we can help you with your Menswear requirements in Yorkshire and Lancashire? You could be forgiven for thinking that with a name like travellingtailor.co.uk we are all about made to measure suits, jackets and trousers; we’re not, we also specialise in ready to wear garments as well as offering a shopping buddy service. Our shopping buddy service does exactly what it says, Michael will accompany you on a men’s clothing shopping trip for either half a day or a full day, you choose. With over 30 years of experience in the men’s ready to wear clothing sector he can advise you on what looks good on you and what you should be wearing, all you pay for is his time (and travel expenses). There is no pressure to buy, it’s your choice, all Michael will do is offer suggestions and probably encourage you to try garments that are different from what you might normally choose but ultimately, the final decision is left to you. This week has all been about Ready to Wear Menswear at TravellingTailor.co.uk and men’s trousers to be more specific with me visiting clients on Monday, Wednesday and Thursday to discuss their specific trouser needs. On Monday I visited a client in Liversedge to deliver some men’s ready to wear trousers to him. This particular client had complained that he was unable to get trousers that had a sufficiently long enough fly since many trouser manufactures had gone down the road of the fashionable short rise. I managed to provide him with a pair of Navy and a pair of Camel colour Douglas & Grahame San Remo Poly/Wool trousers that had the more traditional slightly longer rise but not the high rise style that a certain reality show judge wears! 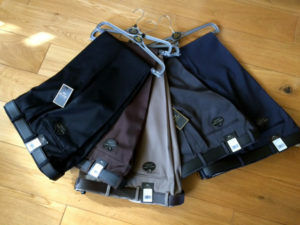 These trousers are machine washable at 40˚C and come in a variety of colours including, Navy, Black, Charcoal, Mid Grey, Camel, Petrol Blue and Brown. They are available in sizes 32” – 48” Waist and cost £64.95. 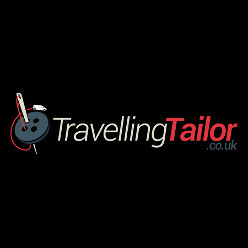 Why not contact Michael at TravellingTailor.co.uk to discuss your trouser needs. We’ve had a busy week this week as far as the Travelling Tailor van is concerned. The paperwork finally came through allowing us to swap number plates and put our old Laurie Hopkins Menswear L1HOP mark on the van. 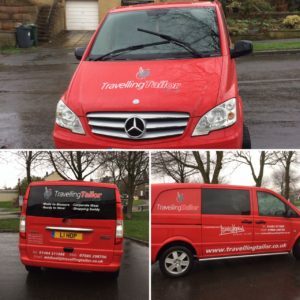 We also had the van booked into customdesignsuk.com for vinyl graphics putting on, Steve has done a fantastic job and the TravellingTailor.co.uk van is now more visible than ever. So watch out for it as we drive around bringing quality made to measure suits and ready to wear garments to the men of Yorkshire and Lancashire. 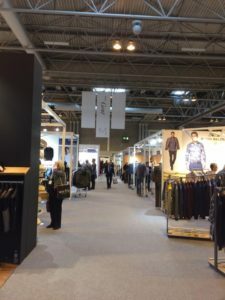 Today was a first for travellingtailor.co.uk, we visited the Moda menswear show at the NEC just outside of Birmingham. It wasn’t the first time I’d been to the show, I’ve been many times before but as a Partner in Laurie Hopkins Menswear. The purpose of the show is to showcase the styles and designs available for Autumn Winter 2017 and the overwhelming trend was TWEED! With a name like travellingtailor.co.uk you could be forgiven for thinking that we only provided the good people of Yorkshire and Lancashire with made to measure suits but that’s not the case, we also offer a large range of ready to wear suits, jackets and trousers, all available on a stock service basis and all from various suppliers. 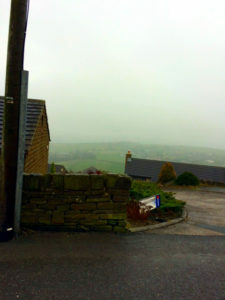 Take today for instance, I have visited a customer at his home in one of the outlying villages around Huddersfield to deliver him a third pair of trousers to a Digel Super 100’s Suit that he bought from Laurie Hopkins Menswear early last year. The fact that the suit was on a stock service meant that despite damaging one of the pairs that he originally bought in an accident at work, in effect he could still wear that suit because I could get a replacement pair – the accident didn’t result in a total write off of a very nice Super 100’s Digel Menswear suit, all it cost him was the price of a pair of trousers. Stock service ready to wear suits are available in a variety of fabrics, styles, fits and sizes, why not telephone us to discuss your requirements?